Tue., Aug. 26, 2014, 5:34 a.m.
U.S. Supreme Court Justice Antonin Scalia, speaking in Boise on Monday evening, praised Idaho's completion of a nearly 30-year process negotiating Snake River Basin water rights as a successful exercise in state rights and local control. "Adjudication serves a noble purpose," he said. "It lets people of Idaho know just what they own. Everything from farming to fishing to mining and manufacturing requires water. Each of these will go smoothly now that they know what they own." The adjudication completion doesn't eliminate future disputes, but provides a guideline for what people might fight over in the future, Scalia said. Water law attorneys have processed more than 158,000 water rights claims. This has allowed thousands of farmers, dairies and fish processors to have a comprehensive record of state, federal and tribal water rights. Scalia was the keynote speaker at Monday's event in Boise marking the end of the largest ever adjudication review settling water ownership throughout nearly 85 percent of the Gem State; with the Snake River Basin Adjudication complete, Idaho has now begun adjudicating water rights in North Idaho. BOISE, Idaho (AP) — U.S. Supreme Court Justice Antonin Scalia praised Idaho's completion of a nearly 30-year process negotiating water rights as a successful exercise in state rights and local control. Scalia was the keynote speaker at Monday's event in Boise marking the end of the largest ever adjudication review settling water ownership throughout nearly 85 percent of the Gem State. "Adjudication serves a noble purpose," he said. "It lets people of Idaho know just what they own. Everything from farming to fishing to mining and manufacturing requires water. Each of these will go smoothly now that they know what they own." The adjudication completion doesn't eliminate future disputes, instead it provides a guideline for what people might fight over in the future, Scalia said. Since 1987, water law attorneys have processed more than 158,000 water rights claims. This has allowed thousands of farmers, dairies and fish processors to have a comprehensive record of state, federal and tribal water rights. The process has been critical in determining how much available water Idaho has left. For example, in some regions, water attorneys found that some basins were fully appropriated. This meant that someone would have to purchase a water right if they wanted to use any of the area's water. The reviewed claims also set a dollar amount on the water rights. Water users now have information on how much their right is worth in Idaho. 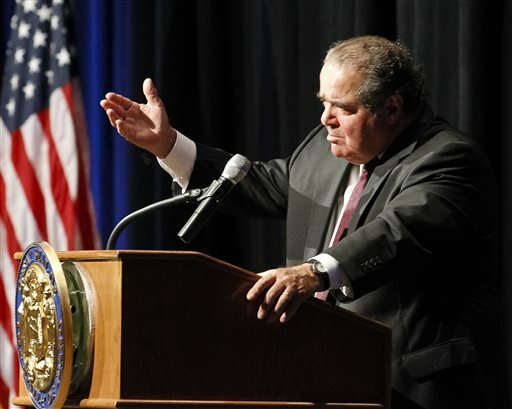 "This is a property rights issues, which falls under state law," Scalia said. Scalia focused his speech largely on Idaho's decision early on to create an entire court devoted to reviewing water rights as one of the contributing reasons to Idaho's success. Idaho is the first state to finish adjudication process on such a large scale, Scalia said. States like New Mexico, Montana and Arizona are still working through their review even though they started as early as the 1950s. It cost the state more than $93 million to finish the review, but that number is still lower than other state trying to complete the same task while fighting lawsuits. The court is based in south-central Idaho, which has been the location of the state's most controversial water battles over proper appropriation among its water users. With the Snake River Basin adjudication complete, Fifth District Judge Eric Wildman who presides over the court will take on adjudicating water rights in northern Idaho. "Today we announce the day that many of us thought would never happen, many of us prayed for it but we still had that question of doubt that it could happen," Gov. C.L. "Butch" Otter said. Otter was one of the 12 signers who crowded a small stage to sign the unifying decree signaling the completion of all but 50 disputed water rights. Other signers included Idaho GOP Congressman Jim Risch, state Attorney General Lawrence Wasden and former Idaho Gov. Dirk Kempthorne.